The Honda Civic, starting this year, will be available with a 1.5-liter direct-injected turbocharged four-cylinder, paired with a six-speed manual transmission as standard, for all coupe models. The Civic was significantly redesigned last year, and looks sportier to compete in a tough market of high-achieving sedans. The Civic has made the jump to be in the race and not get left behind, giving buyers more choices for their money and a little more style to boot. 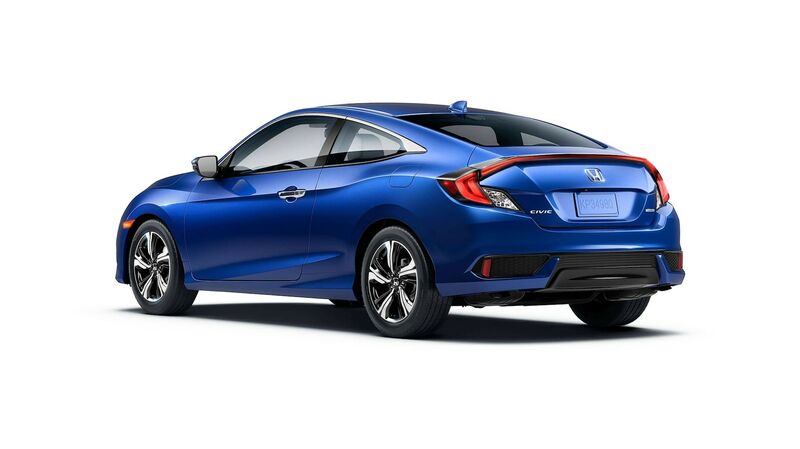 The Civic Coupe version further stands out in that the coupe has not only comfort in mind but fine-tuned driving capability. There is a manual transmission and then there are also available two different Continuously Variable Transmissions that fit directly into a matching model level. A 2.0-liter four-cylinder base engine can be paired with a standard manual transmission (or available CVT). That engine sees 158 horsepower and 138 lb-ft of torque. For 2017, Honda will have in stock for the Civic coupe a new powertrain coupling of a six-speed manual transmission (or available CVT) and a 1.5-liter turbocharged four-cylinder engine. The turbocharged engine gets 174 horsepower and 167 lb-ft of torque with the manual, with the CVT it gets 174 horsepower and a respectable 162 lb-ft of torque. There are five models for the Honda Civic Coupe: the LX, LX-P, EX-T, EX-L, and the Touring. The LX base-model has automatic climate control, 16-inch alloy wheels, and a 5-inch Color LCD screen. The LX-P has all of that plus a remote engine starter, Smart Entry, push button start, and power moonroof that only needs 1 touch to operate. Moving upwards in trims, the EX-T has those features just mentioned plus adds the new and turbocharged engine, 17-inch alloy wheels, a 7-inch touchscreen, the Honda ‘Lanewatch’ system, Apple Carplay / Android Auto capability, and HD Radio. Now wrap all of those features up into the EX-L model and lean the features towards luxury with leather-trimmed seating, and both a leather-wrapped steering wheel and shift-knob. And just to save you a step, an auto-dimming rearview mirror feature as well. Let’s say you like all of that but you also know that you travel a lot in your daily activities; you are on the road for work, for instance, driving from region to region and meeting clients and vendors. This is where you entertain the notion of getting the smooth-riding Touring model, which has all of the features from above but then makes travelling easier and safer by adding a few more. There’s a satellite-linked navigation system, LED headlights (with auto on/off), a 450-watt premium audio system (10-speakers/subwoofer), and the strong safety of the ‘Honda Sensing’ tech to attain that goal of making long trips nicer for you. What is the turning diameter on this vehicle? It’s 35.7 feet curb to curb! Our experts will work to an accurate trade-in price. To begin, Click Here! Are there any Service Specials going on this month at Bosak Honda Highland? We have wondrous specials happening in our Service department: Service Specials! A ton of the stellar feature sets of the 2017 Honda Civic features carry over from the prior model year, where it was fully redesigned. Safety features include an ACE body structure, front, side, and curtain airbags. Standard active safety features include 3-point seat belts, the Latch system, ABS brakes, brake assist, LED daytime running lights, and a multi-angle rearview camera. Optional safety features on the EX-T and above include dynamic guidelines for the rearview camera and the ‘Honda Lanewatch’ system. The Touring edition sees all of that plus gains the Lane Keeping Assist System (LKAS), Adaptive Cruise Control with Low-Speed Follow (ACC), and a suite of other features within the Honda Sensing collection. What’s to stop you from heading on over here to Bosak Honda Highland to see for yourself? Or give us a call today at (800) 959-4660.